Quick, Simple, and Instant £1,000 Credit! Opening a Masters Credit Account takes just 1 minute and approval is instant. As a trade customer, if eligible, you’ll be given a guaranteed £1000 credit which you can start using straight away either online or with our contact centre. Perfect for managing cash-flow and makes ordering on the go a doddle. Ideal for efficiently managing your accounts and making easy payments. Easily keep track of your account at the click of a button. Your online account lets you check your available credit, the status of an order or make a repeat purchase of your top products. As a tradesperson and if eligible, you’ll receive a guaranteed £1000 credit for you to use straight away. If you need more just give us a call and we’ll be more than happy to help. We’ve got options to suit every business. 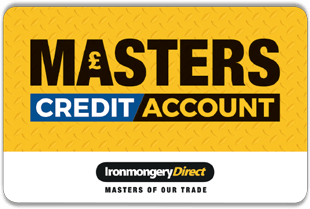 Get your Masters Credit Account today!